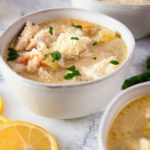 Lemon and parmesan cheese add bright flavor to this comforting, easy to make lemon Parmesan chicken noodle soup. Heat olive oil in a medium stock pot over medium heat. When oil is hot, add onions, carrots, celery, and garlic. Cook for 3-5 minutes, stirring regularly. Add chicken and season with salt, pepper, and thyme. Cook for an additional 3-5 minutes or until chicken starts to brown. Add the chicken broth. Bring to a simmer. Add orzo and simmer for 10 minutes. Stir in lemon juice and Parmesan cheese. Serve hot. Garnish with fresh parsley if desired.